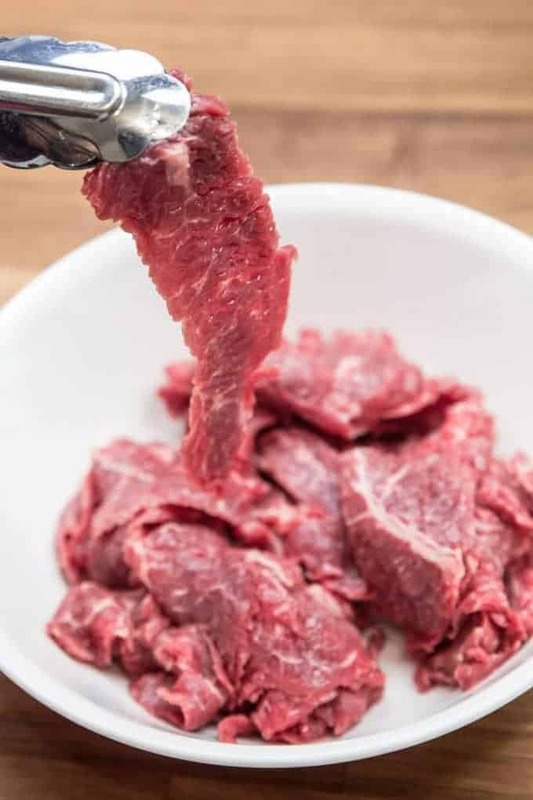 The cut of beef and how you slice it will affect the tenderness of the beef when it’s cooked. We normally use flank steak for beef and broccoli stir fry because of its’ strong beefy flavors. 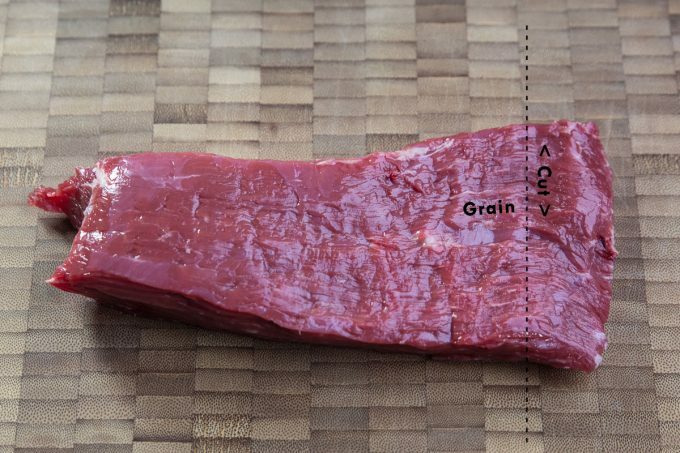 Slice the beef as thin as you can at a 20-degrees angle against the grain. As for the broccoli, chop it into large individual florets instead of small florets. This will give you more crunch for the dish in contrast with the tender beef. We needed to find the optimal method and cooking time for tender beef before we make the actual Beef and Broccoli dish. So, we first experimented cooking the beef at high pressure with different cooking times and release methods. It was only until we’ve cooked at high pressure for 35 minutes plus natural release that the beef was finally tender. But don’t be mistaken! It was tender only because the pressure has broken down the meat fibers to a point that they’re falling apart. The flavors and nutrients of the beef have already gone to the sauce. Thus, you’ll get a rich sauce, but the beef itself will be close to tasteless. Plus, would you want to cook this dish for 35+ minutes when you can finish it in the wok in 10 minutes? 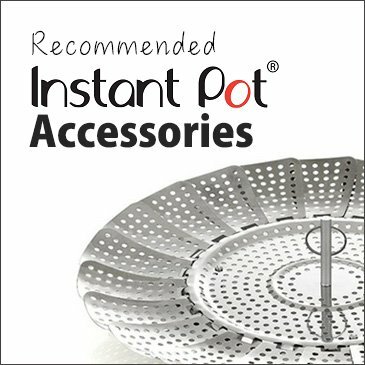 We know that not every household has a wok, so, instead of pressure cooking the flank steak, we’ve decided to test if the Sauté More function of our Instant Pot Electric Pressure Cooker is capable of making this stir fry dish deliciously. If you still want to make this dish with pressure cooking, avoid using lean cuts like skirt steak or flank steak. Try using a fattier cut such as beef stew meat. But keep in mind that, it’ll still take at least 20 minutes to cook this dish taking everything into account. Now it’s YOUR turn to cook some Easy Beef and Broccoli Stir Fry! Make this flavorful Chinese Easy Beef and Broccoli Stir Fry recipe in 25 mins! 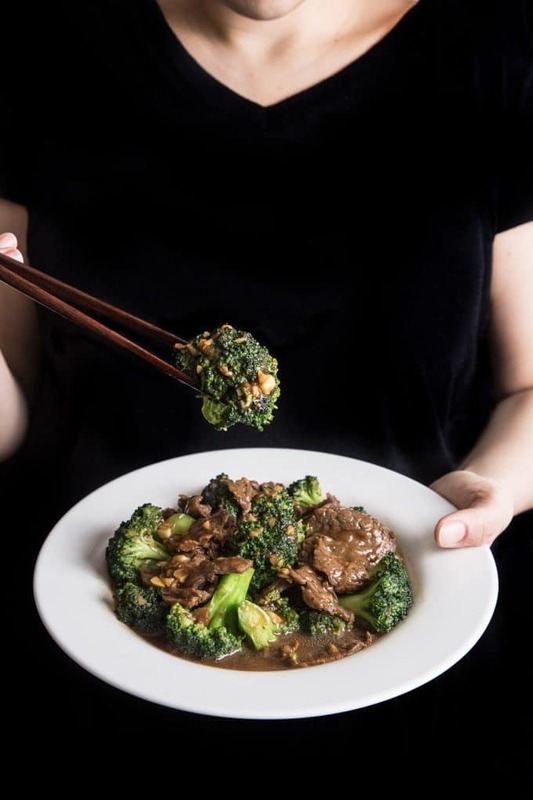 Tender beef & crunchy broccoli soaked in delicious garlicky ginger sauce. Marinate the beef for 20 minutes with two thirds of the Stir Fry Sauce and corn starch. Boil water in a medium pot, add salt and blanch the broccoli for 1 minute. Then, drain the broccoli and set aside. 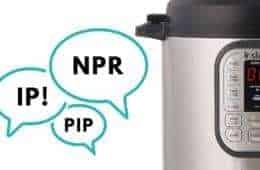 Heat up your pressure cooker (Instant Pot: press Sauté button and click on the adjust button to go to the Sauté More function). 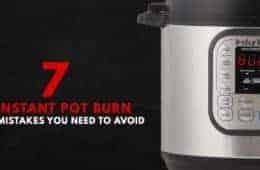 Make sure your pot is as hot as it can be when you place the marinated beef into the pot (Instant Pot: wait until the indicator says HOT). Add 1 tablespoon of peanut oil into the pot. Make sure the oil is smoking hot. Add the marinated beef into the pot, stir and cook until 80% cooked, then remove and set aside. Add one tablespoon of peanut oil into the pot. Add garlic and ginger, then stir for 30 seconds to flavor the oil. Add the broccoli into the pot, stir and cook for roughly 1 minute. Add the beef back into the pot, then add Shaoxing wine, stir and cook. Continue to stir as you add the remaining Stir Fry Sauce to the pot. Stir and mix well, add salt to taste (please taste!). Optional: thicken the sauce with an extra tablespoon of cornstarch mixed with 1 tablespoon of water if desired. It’s very important to cut the beef as thin as you can on a 20 degree angle against the grain. Please note: Different soy sauces have different levels of saltiness. I only needed to use 1 tablespoon of light soy sauce from my old bottle and I had to use 2 tablespoons with the new bottle I just bought. Please taste the stir fry sauce and adjust accordingly before marinating the beef. Love your recipes! Thanks for putting them online! I’ll definitely be try7ng them out! Especially this one! I just love your recipes. Made the Chicken Teriyaki last night and the family asked for Beef and Broccoli. I used a bottled teriyaki sauce diluted for the chicken last night and it turned out great. Is there a stir fry sauce I could purchase? I already have so many bottles of different ingredients in the pantry and fridge. Thanks in advance for your expertise! 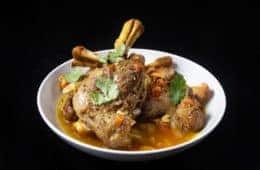 Could I use Top Round Roast for this recipe? For a quick stir-fry, top round roast will work just fine. Cooking it too long and it will become quite tough! Thank you for this recipe. Can I substitute coconut aminos for both of the soy sauces? Coconut aminos will be a good substitute for light soy sauce. As for dark soy sauce, you can omit it or add in a little bit of sugar. This is delicious! I made it with some odd portions of steak I had in my freezer, and added sliced mushrooms and onions. The prep was easy, the cooking fast, and the taste is fantastic! Pair it with your IP jasmine rice recipe, and it was a perfect meal! Thanks for sharing! I know it sounds crazy, but I used a chuck roast. Sliced it thin, marinated overnight and cooked for 6 minutes on high pressure. The meat was so tender and full of beef flavor. A perfect match for broccoli and rice. Maybe try to experiment with different cuts of meat? Love your site and recipes!! It’s great to hear from you again. Hope you have been doing well. 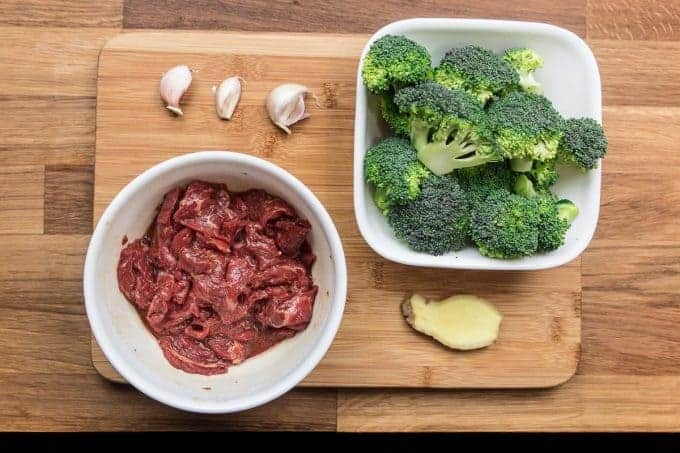 Making Beef & Broccoli with chuck roast is on our to-make list as we thought it will come out well too. What would be a gluten free substitute for the shaoxing wine? you can substitute shaoxing wine with sherry wine. 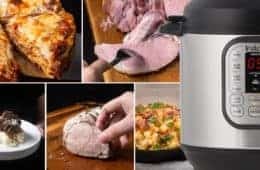 My daughter just gave me an Instant Pot and I am looking for recipes that are simple and not to much for feeding my husband and me. And, when I get more confident, maybe I will be looking for fancier recipes for guests! Am I missing something in the recipe? In the discussion there are various times to pressure cook the beef but in the recipe I don’t see WHEN to pressure cook the beef. Did you decide to ditch the pressure and just stir fry? Or, where to do the pressure cooking……at step #5? Should I add the stir fry sauce to make sure enough liquid? And, could the broccoli be added to the beef as a 2nd step and briefly pressure cooked? 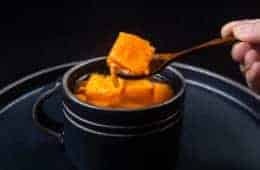 Thanks for a great site with many recipes I’ve tried and enjoyed in my new IP. Am I missing something in the recipe? Did you decide to ditch the pressure and just stir fry? Nothing is missing 🙂 We decided to ditch pressure cooking for flank steak. The result from stir frying (even in Instant Pot) is better than any of the time we have tried with pressure cooking. Should I add the stir fry sauce to make sure enough liquid? Not for stir frying! You would want just enough sauce to coat the ingredients. could the broccoli be added to the beef as a 2nd step and briefly pressure cooked? Definitely! You can cook the broccoli prior to stir frying the beef. Cook them on a trivet with 1/2 cup of cold water and 0 Minutes + Quick Release at Low Pressure. Place them in a cold water bath to keep them from overcooking. Wipe dry the inner pot before continuing with the recipe. Here is our broccoli recipe for reference. I don’t seems to find Flank steak in the UK? Any other steak I could use for this dish instead? Any substitutions for peanut oil? Peanut oil gives it that authentic stir-fry smell. Canola oil is a good substitution as it is quite neutral. What would be a good substitute for the Shaoxing wine? I live in Costa Rica and have never seen this wine here. Thank you in advance for your help. Thank you for a great recipe. Who needs take out when you can make this so quickly at home? I have a question about step one of the instructions that I hope you can answer. It says, “Marinate the beef for 20 minutes with two thirds of the Stir Fry Sauce and corn starch.” Do I mix the cornstarch into the sauce or do I dredge the meat with the cornstarch prior to pouring on the marinade / sauce? Thank you for any help / guidance you can give me! the Chinese method is to mix the stir fry sauce with the beef first and mix in the cornstarch to the marinade. It is a technique that many Chinese believes the cornstarch will seal/lock in the marinade/juice. 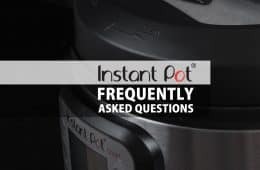 In my mind, I have the same thought as you… Why cook broccoli beef in the Instant Pot (under pressure) when it’s so easy and quick to do it on the stovetop? I see rave reviews on FB for the broccoli beef, but I’ve not tried it because I love my current recipe already. It’s similar to yours, except no Five Spice… I think I’ll try that next time. Thanks! I was just looking for an easy beef and broccoli recipe! This is perfect, thank you.